Remember childhood anxieties? In grade school I worried every day about my school locker. A lot of the time the darned thing wouldn't open. The lockers were old and the combination locks didn't work very well for a lot of us kids. Aways I worried at the end of the day it would make me miss the school bus that would take me home. Why couldn't they just give us each a key? When I was a little kid there was a print of a Winslow Homer (Am. 1836-1910) watercolor hanging above the couch in our living room. I didn't like it much and can remember sitting on the floor at three years old thinking he should have made his forms more detailed. I actually thought that when I grew up should I choose to I could paint much better watercolors than this Homer fellow. Still it had an amazing ability to make me look at it. The whole business troubled me. Over the years that print of the Homer watercolor got better all by itself. 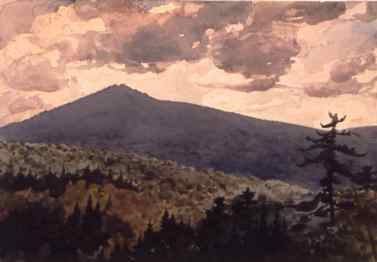 Above is a Homer watercolor that's new to me, Burnt Mountain now in the Addison Gallery of American Art. It's got a wonderful darkly glowing quality to its murky purple greys. Homer made so many works on paper. Here was an artist who painted hundreds of major oils that surely took him months to execute. Yet he would fine the time to do countless works on paper too. 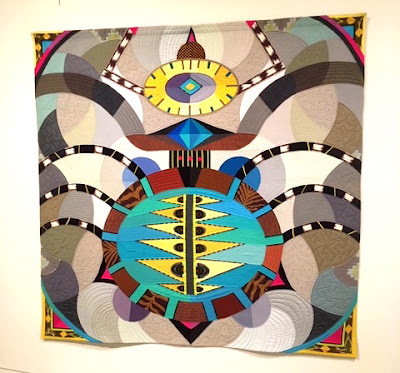 I believe he felt making them opened a door for him to a more expressive way of seeing. 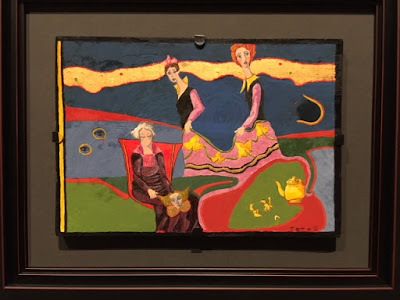 When I first started seriously painting and would visit art museums I had a dark secret. I didn't like the galleries filled with oil paintings. They seemed to resist me somehow. 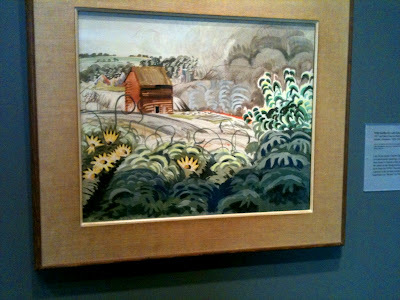 But I was curiously attracted instead to the galleries showing works on paper. For reasons I don't fully understand drawings and watercolors showed me more of their secrets than the oil paintings. They seemed eager to share with me their little delights of composition. Over time my eyes grew accustomed to the weightiness of oil paintings and I came to enjoy them as easily as works on paper. But I remember it was art on paper, whether that first Homer painting in my childhood home or those drawing shows in museums, that served as the key. Maybe for all of us our task is to find what it is that will open the doors that are locked to us. To this day, drawing on paper plays a huge role in helping me make my oil paintings. To make art you have to try things you don't really know how to do. I find I worry less about jumping off into the unknown when I work on paper. If it works, great, and if not, all I've lost is a piece of paper. It frees you up in a way the heavy, sturdy, and expensive materials of oil painting don't. I think Winslow Homer felt the same way. Here's a photo I took of my easels in my studio last week. On the right are two pastels and on the left easel are two in progress oil paintings I'm working up based on those pastels. 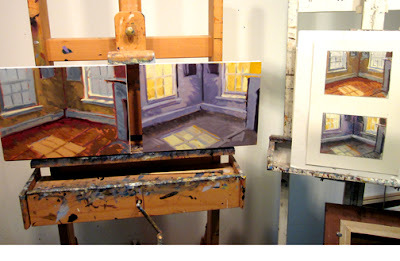 The images are of Edward Hopper's bedroom in Nyack, NY. My exhibit Inside Edward Hopper's Truro Studio: Paintings by Philip Koch is currently hanging in this room in what's now the Edward Hopper House Art Center (through July 1). 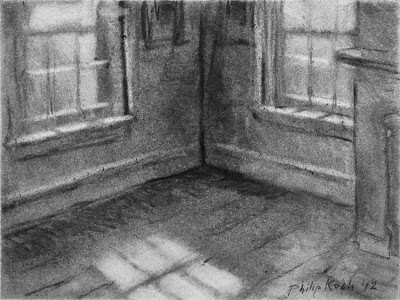 This is the source for the two pastels, a vine charcoal drawing I did on location standing in the doorway to Hopper's Nyack bedroom back in April. 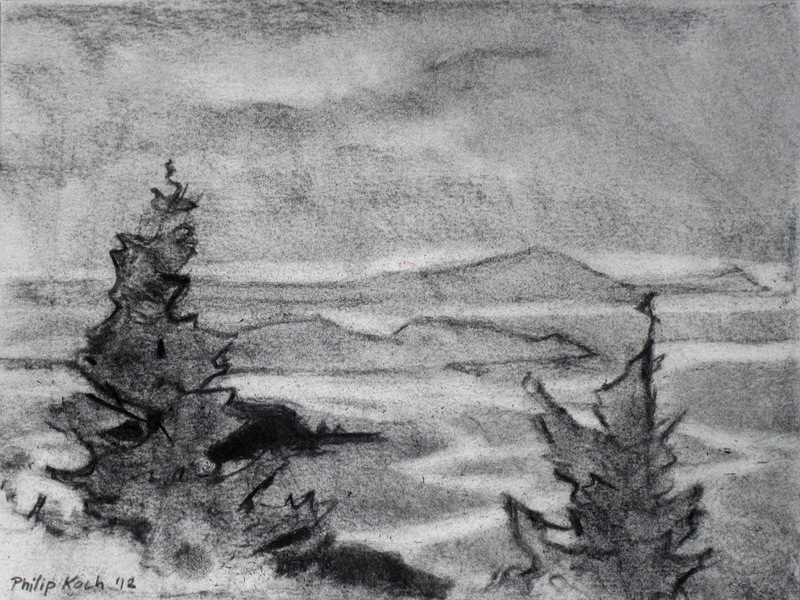 I'm just returned from a week in Maine's Acadia National Park where I made what I hope will be a whole lot of "keys" to make possible some new large, ambitious oil paintings. Here's Cadillac Mountain III, vine charcoal, 9 x 12", 2012. I started this post with a watercolor by Winslow Homer and then moved on to show some of my Edward Hopper themed work. 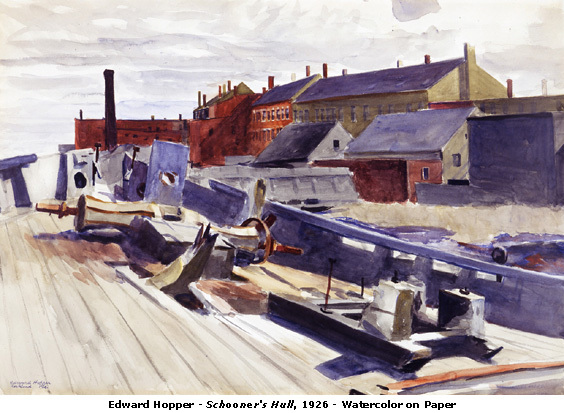 Very much in the Homer tradition, Hopper did enormous numbers of works on paper from quick compositional sketches for his oils to watercolor compositions like this investigation of a ship's hull and factory. You can see into his thinking as he sizes up this very complicated jumble of unrelated forms. How can I make sense of this he asked himself? What he did was experiment. Segregating most of the cooler blue greys and tans up into the foreground he reserved his warmest rust colors for just the far distance. Was the source really like that? Probably not. But Hopper knew his job was to evoke the feeling the place had for him. He was willing to try moves he had no guarantee would work. So he tried unlocking the problem by working on a modest scale on paper. Hopper is never described as a playful man, but to me that's exactly what he is when he works on paper. There he's willing to just follow a whim to see where it would lead him. I appreciate you taking the time to create this blog. It has been very helpful to me. Thanks.